Imperial Protective Service LLC | "Our mission is to ensure the safety and well being of our clients while maintaining the utmost discretion". According to preliminary statistics recently released by the U.S. Bureau of Labor Statistics, nearly 17 percent of all workplace fatalities in 2011 were the result of workplace violence. The 2011 Census of Fatal Occupation Injuries (CFOI) found that there were 4,609 fatal working injuries in the U.S. in 2011, of which 780 were attributed to a result of “violence and other injuries by persons or animals.” Of the 780 fatal work injuries that were the cause of violence, 458 were homicides and 242 were suicides. A Florida family and two others have filed lawsuits claiming casino security acted like thuggish goon squads and attacked them during disputes at the famed gambling mecca. In one case, a family said, their 17-year-old daughter’s nose was broken. Seems like more and more stories like these are surfacing. You’d think these companies would hire guards that are less aggressive and more diligent. The focus of a security professional should be on safety; protecting the client and the clients property is number one. If aggressive force is needed, it should be used as a last resort. MURRIETA, Calif. — A California mayor urged residents on Monday to fight a plan to fly migrant families from Texas for processing at a Border Patrol facility in his city. Murrieta Mayor Alan Long said border officials told him a flight carrying 140 people was expected Tuesday. Migrants will be processed and turned over to Immigration and Customs Enforcement. Still, he urged residents in the Riverside County suburb of 107,000 people some 60 miles north of San Diego to call their elected officials and voice opposition to the plan. 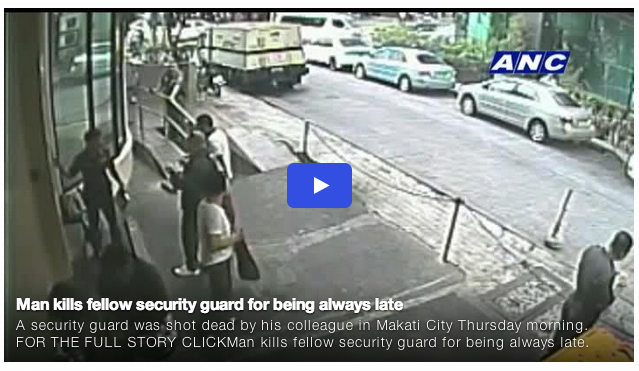 Man kills fellow security guard for being always late. If this is not a reason enough to start using well qualified security professionals, then I don’t know what is. Every day I flip on the news and I see one unprofessional body guard mishap after another. 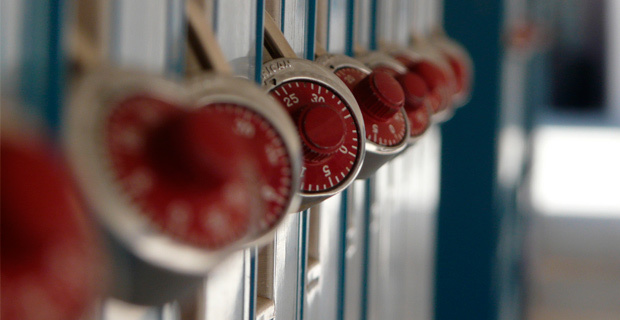 I think it’s time businesses reevaluate their security protocol and hire trained individuals. A few minutes after 7 a.m. on Thursday, June 26, security guard Dante Bangalan was getting more and more irritated as he waited for the one who would take over his shift at the Makati City bank. Just then, Allan Quides, the security guard for the next shift arrived. He was late and not yet in his uniform. Closed-circuit television (CCTV) footage from the bank showed that Bangalan and Quides then got into an argument. Their heated exchange soon turned physical. At some point, other people in the area tried to intervene. However, Bangalan ended up drawing his .38 caliber revolver. 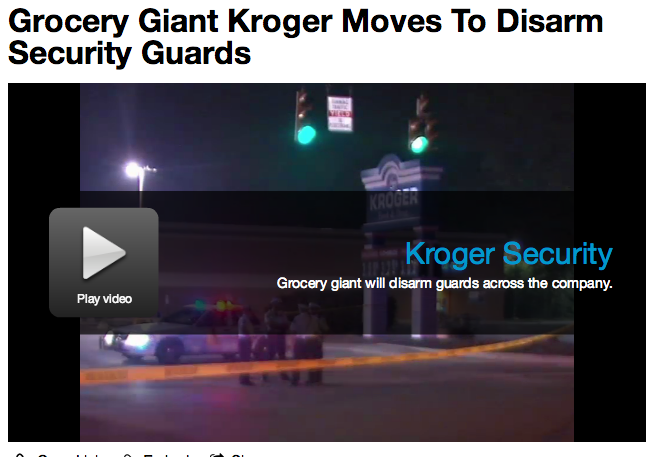 COLUMBUS, Ohio – Changes are in the works when it comes to how Kroger stores handle their security. 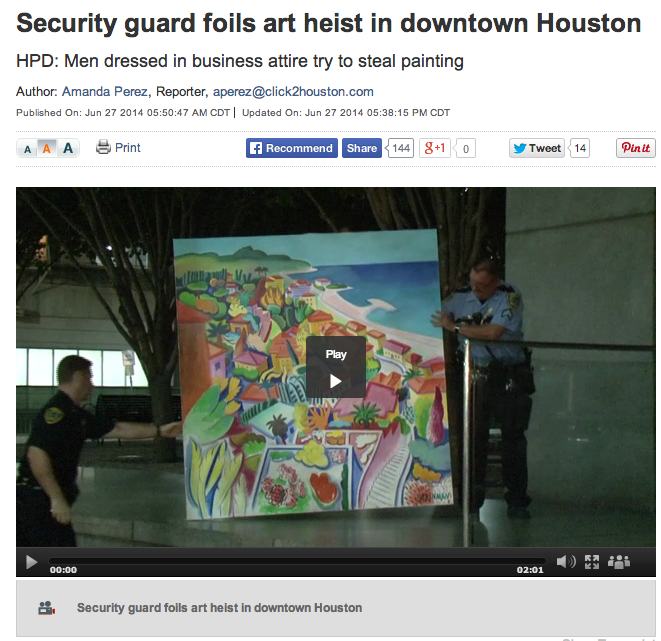 Two men are in jail after security guards at Houston’s Chase Tower were able to thwart a bold art heist. Police say the men tried to steal a painting using the tunnel system below, but it turns out there were some kinks in their plan. It sounds like something out of movie. Police say first they tried to trick a security guard and then went underground, but they didn’t realize they were on camera the entire time. OKLAHOMA CITY (AP) — An Oklahoma company has created a protective blanket that developers say could give children a better chance of surviving debris from a tornado — or bullets from a 9 mm handgun. Steve Walker developed the pad, The Oklahoman reported Walker started on the idea after a massive tornado struck last year in Moore, killing 24 people including seven children inside an elementary school that didn’t have a tornado shelter. The Border Patrol distracted by a surge of Central American migrants crossing into south Texas, Mexican cartels have had an easier time smuggling illegal drugs across the border, according to agents and state officials.